I'm pretty sure that Pinterest is a gift straight from Jesus to all of the DIYers, brides-to-be, moms-to-be, and teachers out there in the world. Seriously, how did people learn how to do things before Pinterest? I've had a personal Pinterest account for a while (though I missed out on many an awesome wedding planning opportunity) and recently started one for the blog. (You're following me, right? If not, find the button on the right!) 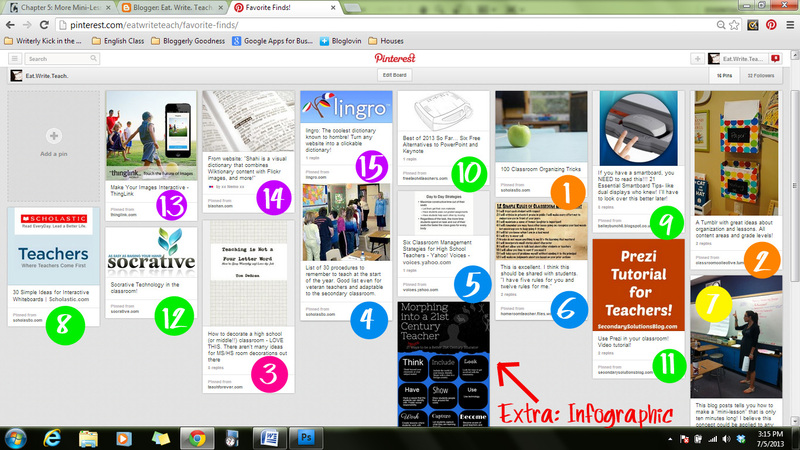 As a frequent Pinner, I'm often blown away by the awesome resources I find for teachers! The internet is a big, beautiful thing, but instead of wandering, lost of days in its immensity, we now have a guide in the form of virtual bulletin boards. Golly, I love Pinterest. It is in any truly enterprising, 21st century teacher's best interest to get on board with Pinterest STAT. (Ha... see what I did there? My subconscious is pretty hysterical. Also, I'm on allergy medicine.) Today, I would like to briefly share fifteen of my favorite Pinterest finds. Let's start this list off right! 100 organization tricks, ranging from uses for old containers to time savers to organization tools to peace in your classroom. Most of these tricks are applicable for all grade levels and content areas. This Tumblr is a collection of teaching tips, tricks, resources, and ideas, by teachers and for teachers. Lots of elementary ed ideas, but adaptable for the older kiddos too. My brain exploded with the possibilities as I read through this list. Oh, and you'll be sidetracked for hours when you open this blog. Mr. DeRosa has a knack for placing links within his posts that make you say, "Ohhh... I wonder what that is??" You are effectively sucked in. Oh and the high school Word Wall and Weekly Contest? Totally gonna try that. A list of general procedures to teach your classes. Again, several of these procedures only apply to the younger classes, but many of them are things that we high school teachers need to remember to teach too! Helpful reminder before the first day of school! I was leery of this one when I saw the source, but pleasantly surprised by this list. Another good refresher! This is the simplest Pin on the list, but I think it packs a punch! If you check out any of these Pins, make it a priority to check this one. These rules are for the teacher to follow. Brilliant. 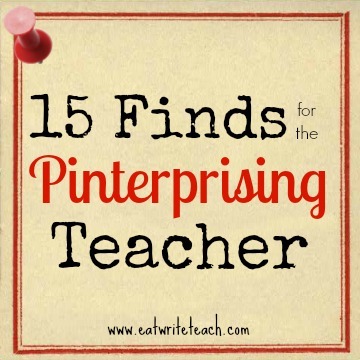 I tried to avoid adding lesson plans to my favorite finds because, let's face it: I'm biased. I'm going to be much more likely to fall in love with an English or maybe a history lesson than a math or science lesson. However, this is good knowledge for all teachers: how to effectively structure a mini-lesson. 30 very spiffy ideas if you are fortunate enough to have an interactive whiteboard. I use many of these on a regular basis, but I think I'm going to amp up my SMART Board use a bit this year. I'm even thinking of letting students take their own attendance as they walk through the door... hrm... Anyway, good list. Holybejesussomanyoftheknowledgesandthethings! You might want to read this one either in small doses or plan a day to read it because OMG there's a load of extremely awesome SMART Board info on here! I just want to roll around in the techie glory of this. Sorry if things are getting weird around here. Okay, the Pin isn't exactly in the right place so you'll have to scroll down through a couple of posts. There's a pretty sweet little video tutorial for those of you who are new to Prezi. I love Prezi. Here's a tired cliche: if you can't beat 'em, join 'em. Quit fighting the cell phones and the tablets and the things and start using those bad boys in your classroom. Socrative can help. I won't go into further details because the website does a way cooler job explaining it that I ever could. All I'm sayin' is, I think it kinda rocks. This website allows you to create interactive images. Basically, you upload an image and create hotspots that can be clicked and viewed. How great would this be for student projects or as a learning tool? I think I'm in love. From the website: "Shahi is a visual dictionary that combines Wiktionary content with Flickr images, and more." I played with it for probably fifteen minutes before I forced myself to walk away. It's neat-o! Maybe kids would bother to look things up if they could use something like this. Okay, this might be my favorite thing here. It is so flippin' awesome! 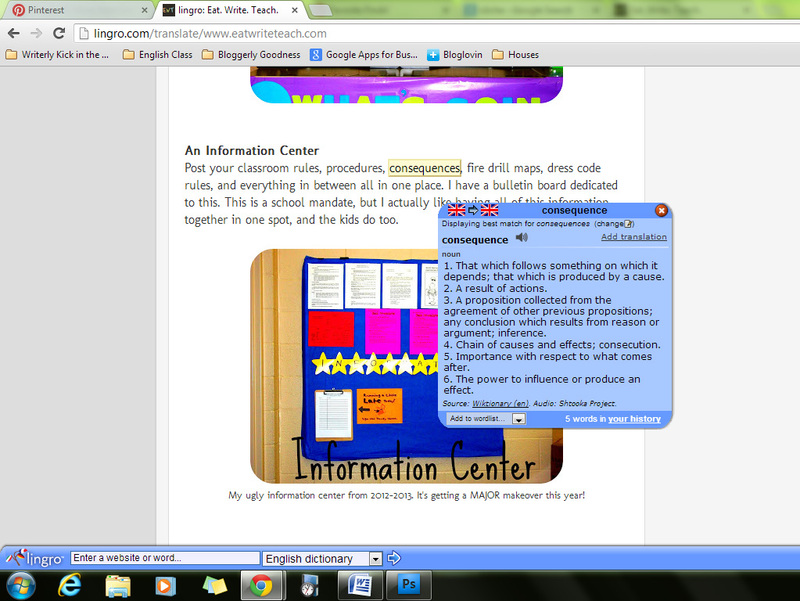 You can basically turn any webpage into a clickable dictionary. You just go the the lingro website, plug in the URL and WAHPAH! Okay, so the page looks basically the same except there is a lingro header bar at the top. But lingro, the sneaky devil, did something amazeballs to the website. 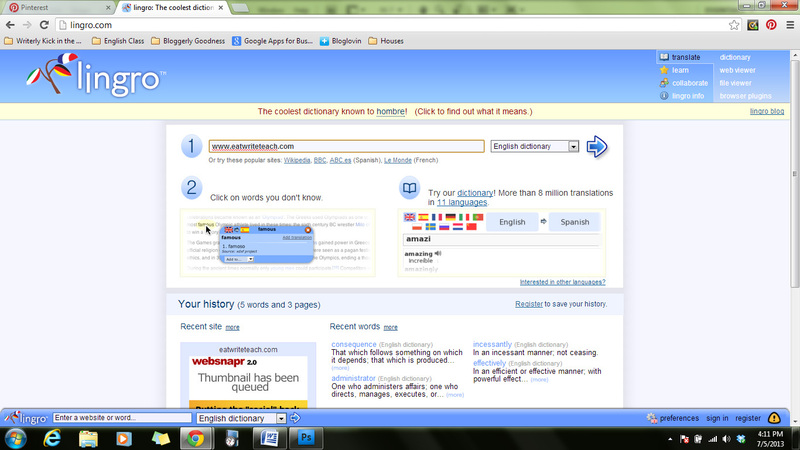 Now you can click any word on the webpage and lingro will define that word for you! Seriously, try this right now. In a new tab, open lingro right now. Right now! HURRY!! Now, paste it into lingro and hit the little blue arrow. There's the website, though it looks just a bit different. 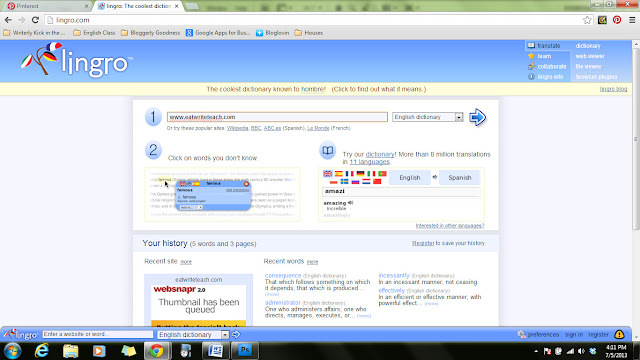 (I've discovered that pages of mostly text, like Wikipedia, look almost exactly the same.) You can now click on a word and lingro will define it for you. How amazing is this as a tool for students! If we can teach them to lingro their websites while they read, just think of the possibilities! How beautiful would this be for research projects, or reading an eBook, or vocabulary development?! Excuse me while I go weep with great joy in a corner. So there they are... my 15 Finds for the Pinterprising Teacher! 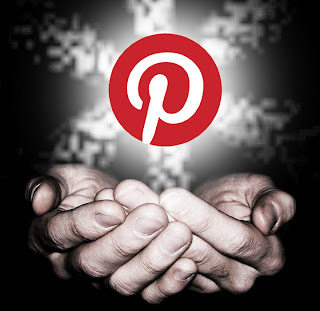 Check out these Pins by visiting my Favorite Finds board and let the Pinspiration begin! A special thanks to Jesus for giving us Pinterest and to my Aunt Diane for that email full of fun tech stuff.